Stories have a real power if they are told well! Using digital storytelling with maps is an exciting means to communicate your experiences. The My StoryMap project uses story mapping to share aspects of their life story. 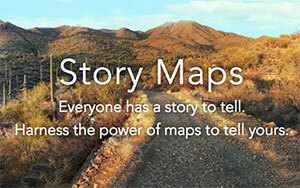 ‘Story Maps’ opens the possibility for people to tell and share their story. They combine interactive maps and multimedia content as a mirror for the users’ personal experiences. The map is used as a means of organizing and presenting information, it allows the visualisation of remote or complex issues. The role of storytelling with maps in education has not yet been fully implemented yet and there has been limited research about its potential impact. But storytelling with maps enables high levels of active engagement as it allows people to personalise their contribution. It gives possibilities for creative collaboration and it has the potential for changing perceptions and for increasing opportunities for learning and deepening a specific topic. compensation (the chance to identify new paths of education or training). Coming soon: training materials for students and teachers.